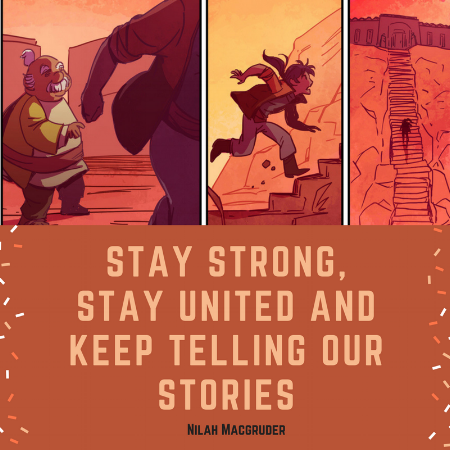 Nilah Magruder is a writer and artist based in Los Angeles. From her beginnings in the woods of Maryland she developed an eternal love for three things: nature, books, and animation. 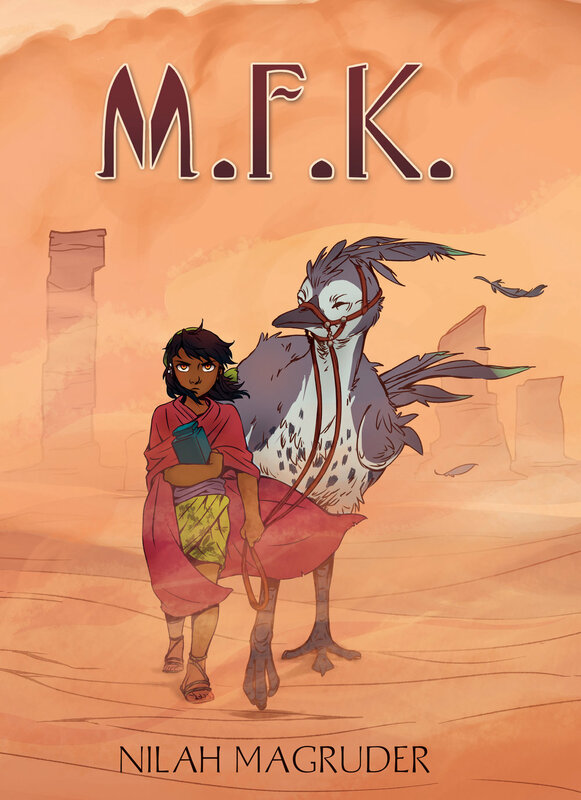 Her young adult web comic, M.F.K., won the inaugural Dwayne McDuffie Award for Diversity in 2015, and has been published in print by Insight Comics. Her first picture book, How to Find a Fox, was published by Feiwel & Friends in 2016. 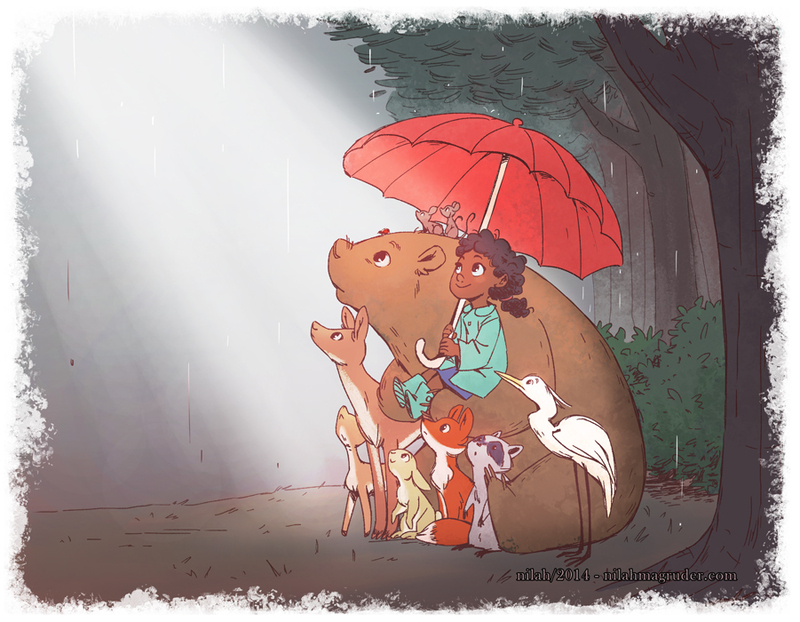 She has written for Marvel and drawn storyboards for DreamWorks and Disney. When she is not working, Nilah is reading fantasy novels, watching movies, roller-skating, and fighting her cat for control of her desk chair. I create children's books and comics. BGC: What about children’s books and comics spoke to you when you got started? I’ve always been interested in children's media. I grew up loving animation and from a young age I wanted to work in animation. A lot of the media that I consumed growing up was targeted towards kids and as I got older I never lost my love of that. I love Disney movies and animation from anywhere really. As I got a little older, that migrated to manga and a lot of that was targeted towards teens. That’s what I always loved consuming and wanted to put back in the world in my own words. Now that I’m older I really think the kind of content we give kids is important, because they're going to grow up with this just like I did. These are stories and experiences that will form the basis of their knowledge and understanding of the world. You don’t always grow out of those early ideas that you ingest when you’re young. I think how we speak to kids and the sorts of stories we tell kids are very important. I just need to do it. If I don’t have this I drive myself crazy. Even when I wasn’t working in the arts, I used to be a journalist and work in marketing and this was my stress relief. It’s what I did to unwind and get away from real life and the things that stress me out. I’ve always loved art. In school when I wasn’t doing visual art, my passion was music and for a long time I thought I’d go to school for music and join a symphony, but then I veered over on this path. Art is something that has always spoken to me, it feeds me in a way. It’s become this thing where I need to do it. Even when I try to get away from it and not think about it my mind always circles back to looking at art and images and thinking about story and characters. It’s always been kind of an escape for me. BGC: Now that is your job, do you need a new form of stress relief or has your stress just gone down? No, my work is not my stress relief, it’s just a new form of stress. [LAUGH] I don’t draw for fun anymore, when I draw it’s with purpose. It’s thinking about the next story or it’s for work or it’s freelance. So to unwind I read a lot. I play video games on occasion when I have time, I roller skate, I go for walks, I go out with friends. At some point I want to take up gardening, but right now I’m just propagating a little plant. I used to garden when I was younger but a lot of hobbies are time consuming. I haven’t found that balance yet of having a hobby I can really lose myself in but also maintaining my work. BGC: What are some of your all-time favorite comics or manga? I was just recently reminded of Beck, which is a manga serialized in US as Mongolian Chop Squad. Beck is a manga about music and I was obsessed when I was a teenager, I loved it. Paradise Kiss always comes to mind because it’s about art and teenagers and feelings, and the art is amazing. Smile by Raina Telgemeier, was a very real story for me because I was also a middle schooler with teeth problems and braces. For Shonen manga I love Naruto, Bleach, and Shaman King. Those are really my favorites. When webcomics came along Strings of Fate by Jen Wang was my jam. BGC: What exposed you to manga and comics growing up? I guess it all started with Sailor Moon and that happened around the time that home internet became a big thing. The timing of both of those things was crucial to my entry into manga. I didn’t know anything about manga back then but I knew cartoons. From learning about Sailor Moon on the internet I learned there are other anime and a most of them are based on comic books, manga. Not a lot of it was being translated but very soon after that Tokyo Pop formed and started bringing over so much manga. That was my entry point right there, really cartoons was always the bridge into comics. I should mention my brother kind of introduced me to anime and it really took hold with my first anime-con when I was 16. I learned about this through the internet and friends going to the conventions and learned of Otakon which was our local convention. The first time I went, everything you need is right there, the exhibit hall is full of anime and manga, that was a huge education for me. I’ve just always wanted to bombard people with my stories. I have a lot of little nieces and nephews and cousins and I just want them to think I’m cool so I keep working hard. I grew up in this area where art was a very traditional thing. I feel like there’s a very different appreciation for art on the West Coast so art has room to be seen as a viable career but on the East Coast it’s traditional, more fine arts. It’s about painting and photography and it’s just not a very practical thing. I grew up being very discouraged about pursuing a career in the arts and I’d love to share with kids that just because you’re getting older, you don’t have to give up art. Art is not a juvenile thing, in elementary school you take art class every week but then that falls away. Once you get to middle and high school, arts becomes an elective and I think that leads to a lack of appreciation for art in our society. I think it’s unfortunate that people devalue art, they don’t understand its purpose or how much of it impacts our world. I would love to hit kids when they’re young and show them art is an important part our society and culture. You don’t have to give it up, you don’t have to have it as a career, you can just have it as a hobby if you want. You don’t need to be an artist to appreciate art. Aside from just loving to tell stories that’s what keeps me doing this, to be an example and be part of the larger conversation of art as a thing in our world. BGC: Why is it important to you as a Black person to create? Children’s books, film, television it’s all predominantly white, it prioritizes one experience. There are so many other experiences, especially in America, that get erased and a lot of people get talked over. There are many Black women who do comics and who are interested in art, but I get this question all the time from people, “Where are the Black women? I never see Black women at Comic Con, I never see Black women working in comics.” I actually had one guy tell me, “In my experience Black women just aren’t interested in writing comics.” I do feel a responsibility to be here because we need people fighting this battle to break through these barriers that exist. People really will sell that lie that Black women don’t exist, don’t have agency, can’t embody a variety of roles, and have no stories to tell. I just vehemently disagree with that. I love art but also feel a responsibility to keep at it and be the antithesis to that lie. BGC: What do you think about how difficult it is to hear that lie repeated to you and said to your face? Does it ever get discouraging to be in a place that feels so unwelcoming and how do you find the day to day strength to continue to go into an unwelcoming space and prove that you deserve to be there? It gets really hard sometimes. There are days when I feel animation is crap, comics is crap, why am I doing this, why am I here? Luckily I’m apart of a welcoming community, I’m in tune with the other Black women who work in comics and work in animation, with non-Black women who work in comics and animation, and we keep each other strong and pull each other up and keep moving forward together. It still gets discouraging, I can’t be positive every single day. I can’t always put my brave face on and plunge ahead, but even on those days when I feel weak I know there are other Black women who are in this industry who are still ploughing ahead. That’s enough, there are enough of us so I don’t have to be strong every day. I do have these moments where I have to sit back and reflect. I have to ask myself why am I really doing this. I love it so much that I eventually rally, and I’ve never hit the point that the negative outweighs the positive. I’ve been very fortunate in my career, I have a lot of supportive people in my life. I try as best as I can to offer whatever resources and knowledge to other people, to other Black women, so that they can find their path too. It’s about the community, there are a lot of stupid people in this industry who have backwards or outdated ways of thinking and I don’t know if you can do anything about those people but what we can do is stay strong, stay united, and keep telling our stories. That’s something they can’t stop. It’s really hard and I’m not doing a very good job at it right now, it gets overwhelming. Sometimes there are just not enough hours in the day and art takes so long to do. I’m not always able to do as much as I want to do. Even if my brain is ready to work, my body isn’t. I’ve hit this age where my body fights against me sometimes so I’m not always physically able to work even when I want to. It’s a struggle to stay in balance. I try to be as organized as I can, and that usually helps. I try to be realistic about my capabilities and just knowing for myself, this is what I can accomplish in this amount of time. In the course of a day, these are the pockets of time that I can work with, but the best I can do is just try not to overwhelm myself because if I get burnt out then that’s it. Just avoiding over extending myself is a real challenge but I’m good as long as I can make a little bit of forward movement everyday. Even if I’m not drawing or writing. If i’m always thinking about it and always planning then usually I’m able to keep some momentum that way. It’s a real challenge and I’m not always great at time management but I do my best. Having a community, having friends and colleagues that I can call on for assistance or who can hold me accountable, that helps a lot too. BGC: It’s nice to hear that no matter the industry, Black women creators make a point to help each other. It’s important to know that because it feels like we get pitted against each other, there can only be one, so you’re fighting for your one spot. It feels like that’s what they want you to do because that’s a distraction. That keeps you focused on each other rather than focused on moving forward. I’ve fallen prey to that sometimes too but I’m trying to get better at staying focused on the path ahead and not dragging anyone down because I don’t need to do that as a creator. My success is not dependent on the downfall of other people, we can all move forward together. I’ve been trying harder to focus on that. BGC: You have your own webcomic. Why is it important to you to create MFK and continue to keep it up when you are so busy? Why has that continued to maintain a level of importance to you? I started MFK in 2002. That was around the time that I came up with the scenes of the first idea and it’s a story that never goes away. I’ve created other stories in that amount of time that have fallen away but MFK is the one that I always come back too. I think because it’s a very personal story for me. Abby was my first foray into writing a story with a Black girl lead. I’ve put a lot of time, thought, and work into developing this world so it’s a natural part of me. It’s not something that I can see ever letting go of, Abby is kind of my child. It may take a long time, I may not always keep up with it, I may have to take breaks like I am right now, but if I’m working on this for another 50 years than so be it. It’s the story of my heart and I love it and I don’t ever see myself walking away from it until the story is done. Hopefully, it won’t take 50 years but it’s a story that I made a commitment to. I had a choice, when I first decided to do a webcomic I had a couple of stories and this is the one I chose because I had already been sitting on this idea for 10 years and didn’t want to put it off any longer. I made that commitment and I want to see it through for myself. BGC: What has been the response from the community so far? It’s been really positive, I’m always bracing myself for the negative reviews or for someone to tell me this is crap but it hasn’t really happened yet and I’m kind of surprised. I’m still bracing myself because now that it’s being published in print it’s going to reach a larger audience. People really seem to enjoy it, a lot of people seem to connect to it which is a shock because it’s such a personal thing. I can see the relevance of it to me, but I can’t always see the relevance of it to other people so it’s always refreshing when I hear feedback and hear that people really do enjoy the story and the characters and they’re eager for more. BGC: Do you have any advice for young creators/ones just starting? Lately the advice I give is to start small, make some comics, don’t wait. You learn by doing, so go ahead and start making some comics and treat it as a learning experience, but start small. If you pick a problem that’s too big you can overwhelm yourself. If you want to start with that really big comic, that really epic idea then by all means do what you’re really passionate about but MFK was my first webcomic, it was not my first comic. I tried doing short comics first and also working on other people’s comics. I got acclimated to the medium before I launch my first epic. That’s what I would suggest. A big project can be overwhelming very quickly and if it’s too much for you to handle you’re setting yourself up for failure so just start small. BGC: Do you have any future projects that you’re thinking about working on? I illustrated a middle grade graphic novel that’s upcoming called Creaky Acres. It’s about a Black girl who moves to an all white rural community and joins their local horse riding club. It’s being written by Calista Brill and published by Dial Books for Young Readers. It’s coming out in 2019, I believe. That’s my other major project other than that and MFK I’m just deciding what else I want to work on. Outside of comics, Canon Busters was recently announced, I did a bit of writing for that and it is an animated series coming to Netflix at some point. BGC: Any last words of wisdom? If art is intimidating for you, if you’re interested in comics and other medium, give it a shot. Learn to appreciate art by doing.